Born in 1969 and having ridden from a young age, William started eventing at the age of 15. 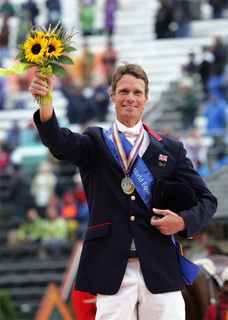 Encouraged by his parents, both of whom completed Badminton and Burghley, he represented Britain throughout his teens, winning individual Silver at the Junior Europeans in 1987, Young Rider Team Gold medals in successive European Championships in 1988 and 1989 and completing Badminton himself at the age of 20. His first Burghley win five years later established him as a regular on the senior British Team and guaranteed him a ticket to the Atlanta Olympics in 1996. William was the first British rider to become eventing’s World No 1, a distinction he achieved in 2002, 2009, 2010 and again in 2014. He has represented his country consistently over the past 20 years, winning team Silver at the 2012 London Olympics, team Silver at the 2004 Athens Olympics, team Bronze at the 2008 Beijing Olympics, team Silver and Individual Bronze at the 2014 World Equestrian Games in Normandy, Individual Bronze at the 2013 European Championships in Malmo, team Gold and Individual Silver at the 2010 World Equestrian Games in Kentucky, team Silver at the 2006 World Equestrian Games in Aachen, and team Bronze at the 2002 World Equestrian Games in Jerez. He has won seven team Gold medals at the European Championships and has been the British No 1 eleven times. He is the only rider to have won five out of the six CCI****’s worldwide having won Burghley (1994, 2002, 2005, 2007, 2008, 2011), Badminton (2004 & 2015), Luhmuhlen (2008), Rolex Kentucky (2010, 2012, 2014) and Pau (2011, 2013). He has won the HSBC FEI Classics, a series linking the top six Three-Day Events in the world, four times (2008, 2010, 2012 and again in 2014) and finished second in 2011. In 2011 William became the first rider to win a record six Burghley titles (on six different horses) and became one of the first riders to ever win a CCI*, CCI** and CCI*** at the same event on the same day - a feat acheived at Tattersalls, Ireland. William has won an unprecedented 14 CCI****'s and 59 CCI three-day events. His achievements in the sport make him one of the most successful British event riders of all time. In 2003 William and his wife, Channel 4 Racing presenter Alice Plunkett, began the development of a 28 stable state of the art training centre in Hinton St Mary, Dorset. In 2005 everything was complete and Wood Lane Stables has been home to Fox-Pitt Eventing ever since.